An Invaluable App - Taught the Apple Store Geniuses a lesson. I took my iMac 27” i7 (Mid-2011) into the Apple Store because the fans were racing intermittently. The technicians tried various fixes, or told me it was due to “non-Apple” memory, or because I was mixing memory sizes (Two 4gb and Two 2gb DIMMs). Nothing worked. Midway through the process, I presented the genuises with what I considered very conclusive evidence from TG Pro that there was an LCD Proximity Temperature Sensor that was either missing or showing a crazy negative reading when the fans were racing. But TG Pro showed two LCD Proximity Temperature Sensors, and the Geniuses swore that there was only one. Their Apple diagnostic software showed only one sensor. And all service manuals and parts descriptions that I found showed only one sensor. I emailed the developer of TG Pro, and he told me that if TG Pro showed a sensor, then it was there. Finally, on what was the fifth return trip to the store for the same problem, one of the geniuses took the TG Pro printouts from me and said they would look at them seriously. Not long after, a technician called and told me that he removed the cable to what they thought was the single LCD Proximity Temperature Sensor, and then he peeled the tape off the entire length of the cable. And you can guess what he found. The second LCD Proximity Temperature Sensor! He replaced that cable, and My iMac has been running like a champ ever since. End of story. 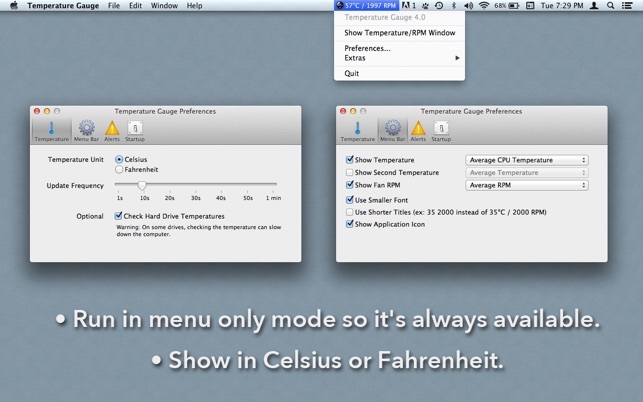 This can open as an app (with an icon in the Dock and in the Command-Tab menu) or as just a menu item in the menu bar, but if you want the menu-only version, then you're forced to have it start up automatically. This is kind of dumb. Why can't I toggle the auto-start function without having to first change another preference that is barely related and where there is no logical dependency? If they want to prevent (or for some reason cannot allow) opening the app as a menu item, then instead of graying out the auto-start checkbox, they should allow you to uncheck that but revert to opening as a full application when you do so. -1 star for this. Furthermore, when I close the app I'm not in the mood to be presented with a nag screen to rate the app, or shown ads for their other apps. Very very annoying. -1 star for each of these. Lastly, I have reason to believe the data the app is presenting is not accurate, since there are times that my laptop feel very cool, but I get endless alerts about it being too hot, while at other times it is extremely hot to the touch and there are no alerts and the reported temperature is much lower than at the times that it is wigging out over nothing. I have not absolutely verified that this apparent problem is in fact taking place, so I'm not taking away any more stars for that. I need to do more testing to make sure I'm not missing something somehow. 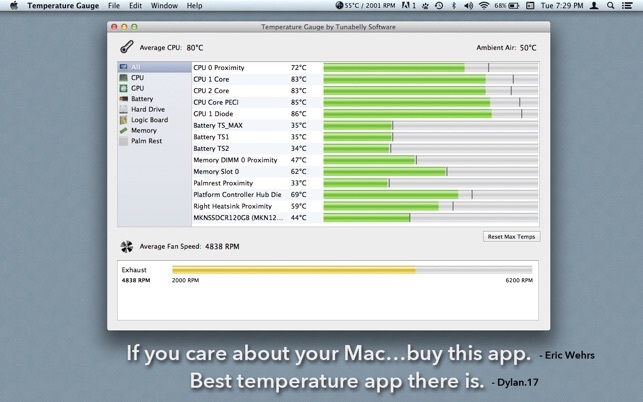 It gives you peace of mind to know that your Mac is staying cool and if not, which apps, connections are pulling a lot of CPU, or other resource heat (e.g., demand). After all Apple provides Power and Battery monitoring, CPU monitoring, network monitoring available to the user. Why not heat? The sensors collect the data and the CPU reacts to that data, perhaps when it’s too late. The user should know about it in similar detail. Since Apple chose not to do so, thansk to TunaBelly we have that capability. Thanks, guys! TG and its big brother TG Pro use little resources on their own and give you the information needed in great detail or less if you set the preferences that way. Pro adds higher than normal fan control if you choose. 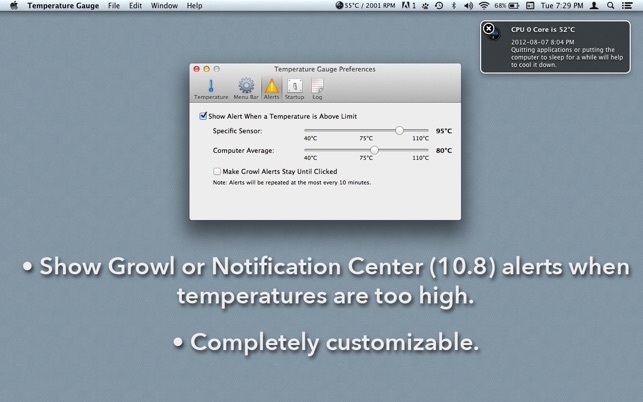 FYI, my machine (15” Retina MBP) runs at 125°F with the fans running silently @ 2000RPM with the cover closed. I was concerned at how that would go. 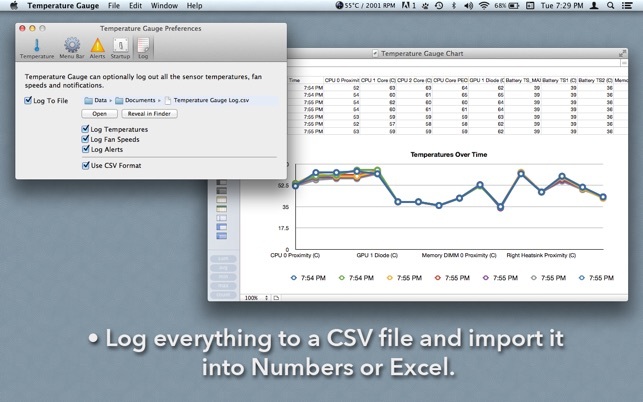 One item they could add is a comparison tool for stock machines and voluntary statistics from other users about the running temperture performance. I think a price point for the base software should be $3.99, but considering the rules in App Store a dollar more to be able to use on any family machine is not too expensive. Congrats to you for a nice bit of software.